WOW! Great turn out for the September meeting. We are very fortunate to meet at the Irvine Fine Art Center. We are most grateful when we can meet in a large studio room, rather than the little room we had the last month. I’m not sure we would have been able to fit in the little Photo Studio room this month. Barbara counted nearly fifty people in attendance this month. Brad Kim presented work from his black and white portrait/street series. 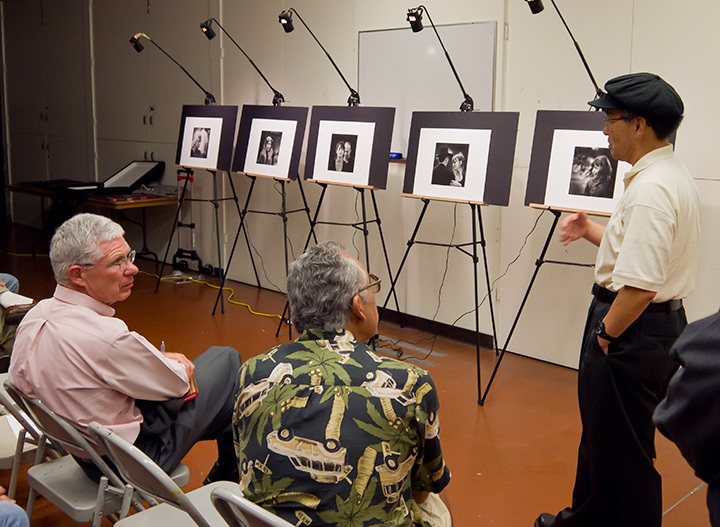 Janos explains his photo-intaglio process to the group. 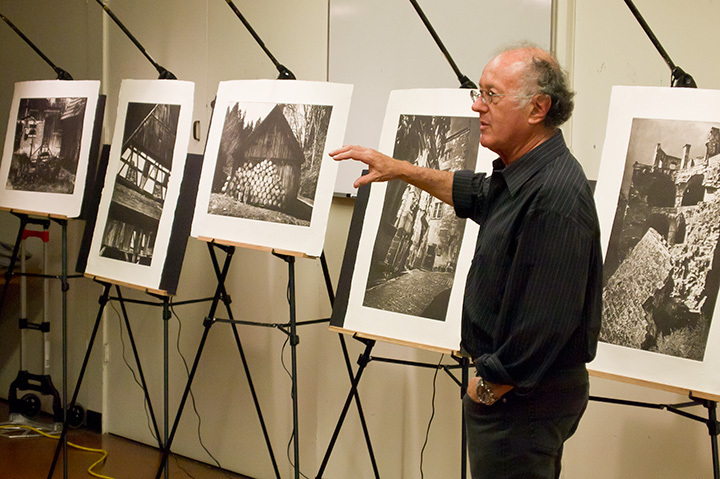 Here Janos shows some of his new photo-intaglio prints, also known as photo-gravure prints. Janos continues to explore this process of printmaking from plates which are inked by hand and printed onto various fine art papers using a printmaking press. I can’t wait to see more of his work as he works with this process. 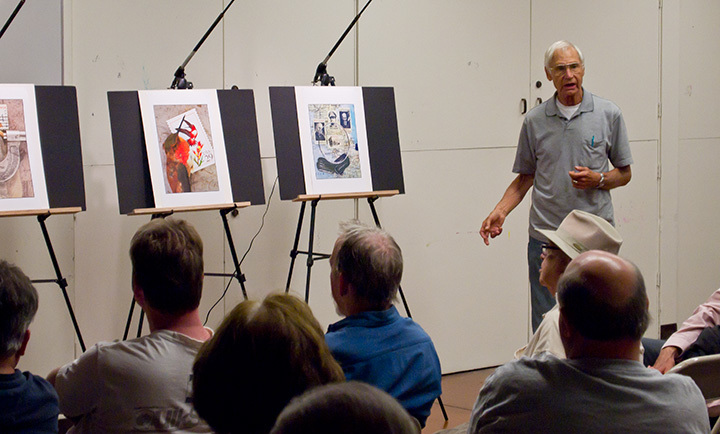 Bill Collins showing his still-life photographs. Bill’s still-life images begin with postage stamps from his collection. He has combined found objects together with the stamps and created still-life photographs that are witty and thought-provoking. Bill is a great example of one end of the creative spectrum that sits opposite of the traditional photographers in the group. The Photographers’ Exchange has always been a great mix of photographic techniques and artistic interpretation. You never know what you will see when you come to a meeting, but you will always find inspiration. First time visitor Beatta Bosworth shows her work to the group. 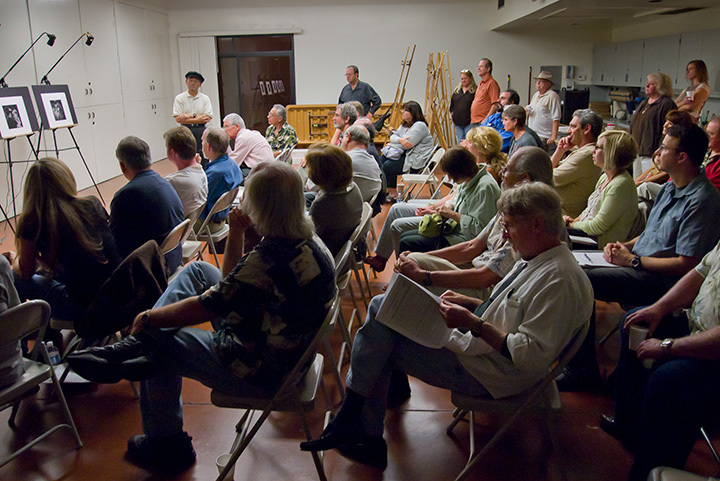 Visitors are always welcome to come to our meetings. It is great when a visitor is brave enough to put their work out to the group for the first time. Beatta showed photographs that she is currently working on. I encourage people to bring work to the meetings that is in any stage of development. I think we can get more from the group viewing or work-in progress, rather than showing finished work. 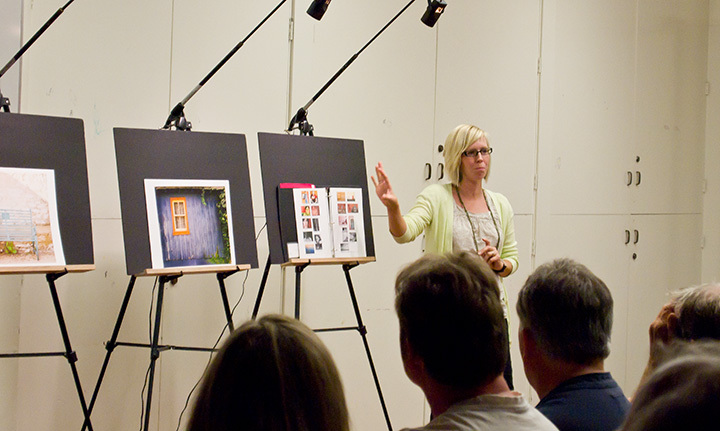 We tend to be more open to the critique when the work is in process. 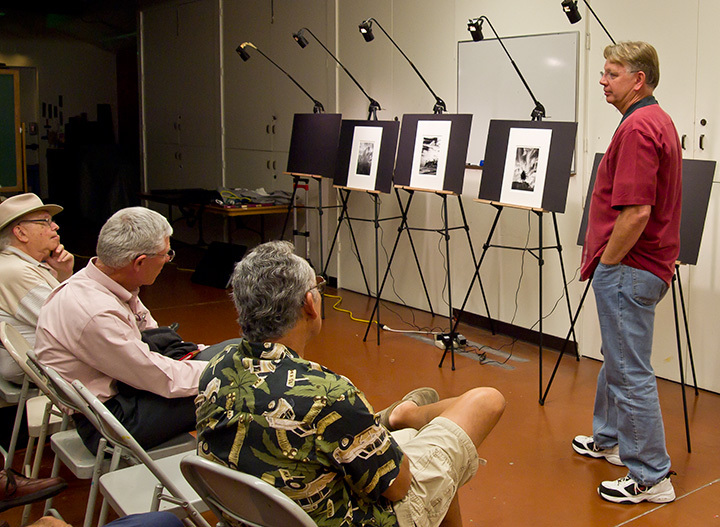 Walt Wenzel sharing some black and white digital photographs. Larry, wonderful update on the creative efforts of the group, especially if someone is traveling and unable to attend. Thanks!